Malaysia will be celebrating its 58th year of independence tomorrow (August 31st). But at this very moment, on the eve before our Independence Day, tens and thousands protesters have taken to the streets to call for reforms, flooding the cities with yellow. We have reached the second day of this 2-day large-scaled rally. This time, people are calling not only for electoral reforms but also for the resignation of the current Prime Minister. It's ongoing, but I need to remember this. 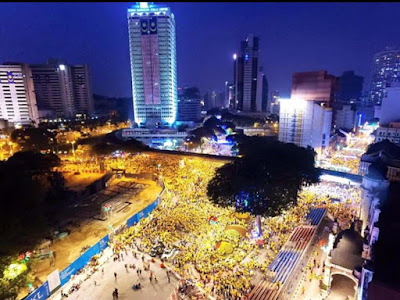 Perhaps this Bersih 4 of 29th and 30th of August, 2015 will be remembered as a watershed moment in our nation's history, even though, unsurprisingly, and typically, such things will surely be struck off from our history books. Here's the Great Leader, condemning the people who wanted to march for the good of the country. Najib said the actions of Bersih were seen as deliberately trying to discredit Malaysia's image at the international level. In the past few decades, the authorities have used numerous questionable methods to spread fear among the people, to divide the nation, to suppress all dissent. Having to go through two generations of this is more damaging than I can ever imagined. The previous generations are constantly living in fear, condemning all kinds of street demonstrations, all kinds of rallies, believing that the known status quo is better than the unknown. This is the upbringing that I have endured. It never failed to baffle me. It's a faraway possibility, but if I ever have children, I want them to stand up for what they believe in, instead of living constantly in fear. I want them to believe that people have to voice out what's good for the country, and drastic measures have to be taken to let these voices be heard, instead of just being quiet and subservient and letting the words of the the previous generations trample over them. If this blog can still survive til then, I want to use this post as a constant reminder to myself. So these are the Facebook posts I have posted leading up to, and during Bersih. Former Prime Minister Dr. Mahathir and his wife Siti Hasmah arrived at #Bersih4 too. It's all for Malaysia. Singing the national anthem at midnight #Bersih4 A day before, our Almighty Leader Najib condemned the protesters for being shallow and not patriotic. A sea of yellow at midnight. A day that ran smoothly from all corners.